Are you interested in what your users think? 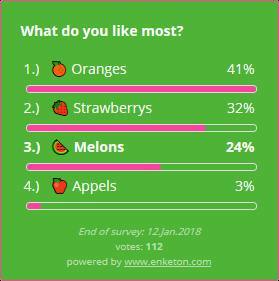 Than create a poll on your website to figure out! It's done within 2-3 minutes. Fill in your question and answers to the form below. Chose your color and do some settings. Press "Update" button to get the preview. Once you're satisfied press the "Get code" button and copy the code to your website. Please fill in the form above to setup your poll. All input or adjustments you do you will see in the preview box on the upper right after you hit the update button. the first step should be self-explaining I guess. Fill in your question and the possible answers your users can vote for. How to delete fields I don't need? Just leave them blank. After you hit the “Update” button empty fields will be deleted automatically. Logically at least 2 answer-fields have to be filled to be able to store your poll. No problem, just hit the button below the last answer-field (need some more answers?) and a further field will be added. Repeat this as often as you like. There is no limit for answers! Here you can setup the appearance of your poll regards color and sizes as well as listing options and time setup. The first for the background of your poll. The second for the text color. The third one is for the highlight/ hover effect, when the user moves the mouse over the answer options. 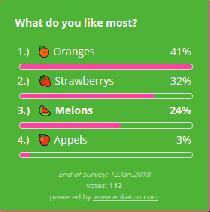 Furthermore this color will be used for the bars in the results, what gets shown after voting. Moreover this color will build a tiny border around the vote-box. You can chose different text sizes for your poll in the pull-down menu. This value will also affect the height of the bars in the results window. Here you can chose a value for the width of your votebox. This value can be a “px” or a “%” value. Hopefully you'll find something that fits to the layout of your website. 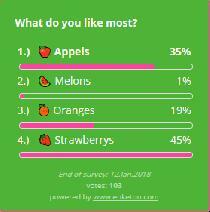 If not you can affect the width of your poll also later on in the HTML-code easily. Therefore please also read Tipps & Tricks. Answers as written or in alphabetic order? By default the answers will be displayed in the vote-box in the same order as you wrote them (answer 1...5). If you like you can switch the radio-button to alphabetic order, than your answers will be displayed accordingly. Results in top-down or original order? Original order will display the results in the same order as the answers were shown before. This means the results page will also respect if you have chosen alphabetic order or not. 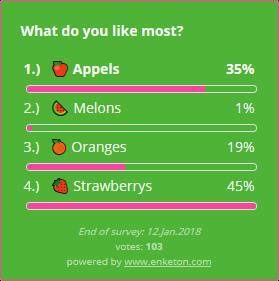 Top-down order will display the results sorted from the most popular answer to the lowest. Original order might behave like that. What is better or worse cannot be answered fundamental and depends on your preference or the kind of survey. For very long lists the original order might give your user a better overview and makes it easier for him to find the thing he voted for in the results. Anyway, in most cases top-down order is recommended to get a clear ranking and keep the overview. Usually it makes sense to end a survey at a certain point of time. After reaching the end of that period users won't be able to vote anymore. If one comes to the site after that time, she will only see the results. This time can be set very precise. Not only the date, even the daytime and moreover your time zone can be adjusted. This makes especially sense if you want your users to vote for football results or any other time limited prediction. At the moment the max. time limit for your survey is 1 year.